I'm am so excited to share with you this EASY Halloween craft. I'm not actually much of a crafter but this was so fun and easy that I loved it. 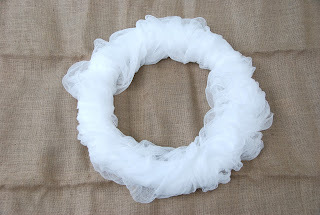 Start by gluing the cloth cloth in place to the back of the wreath. Make sure to unfold the cloth and scrunch it up a bit when gluing. Bunch and loosely wrap the cloth around the wreath. Pull and rip areas of the cloth as you go to make it look ragged. You may need to use a little glue to keep certain areas of the cloth in place. I used it two or three times during the wrapping. When you have finished wrapping the wreath, cut off the extra cheese cloth and secure the end to the back of the wreath with glue. 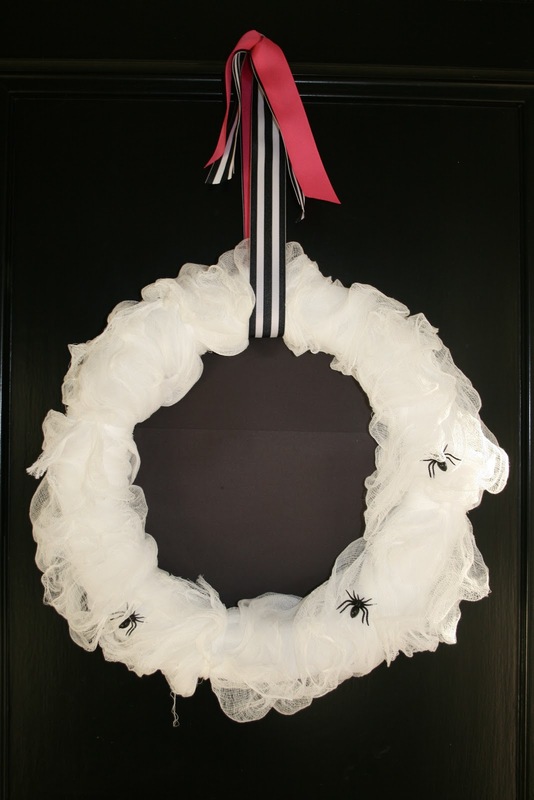 Cut the remaining cloth into approximately three 1"x12" lengths and tie the strips around the wreath to make it appear more like a mummy. 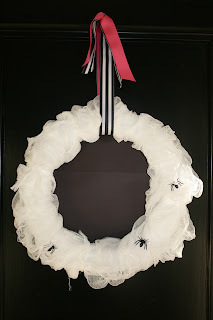 Add a ribbon to hang it with and spiders if you like. That's it! My little guy said it looks creepy!